The Zoological Museum of Barcelona which is part of what is known as Museu de Ciencies Naturals is located in Parc de la Ciutadella. I won't give too much detail, as I just wanted to show the picture and invite you to visit this modernist building. 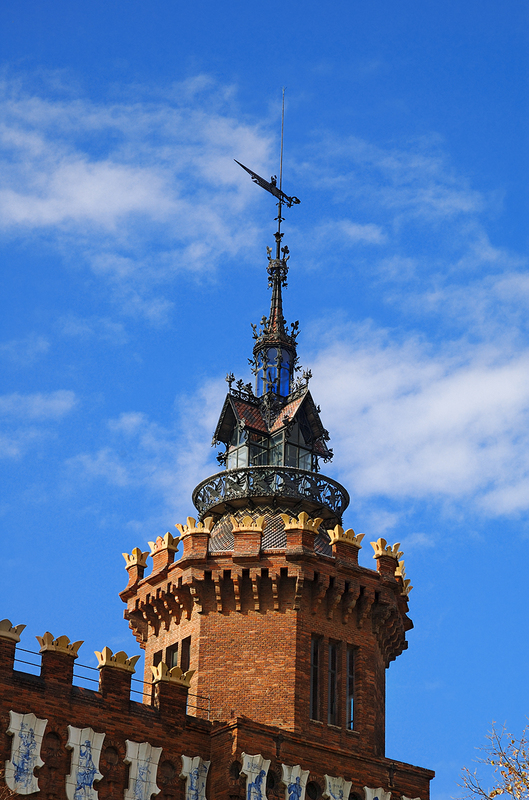 This is a detail of the tower of Moorish reminiscence against the sky. In fact, this is part of the Natural Science Museum which is a group including the Geology Museum (1882) by Antoni Rovira i Trias inaugurated first, the Botanical Garden in Montjuic mountain and this Art Nouveau jewel by Lluís Domènech i Montaner conceived as a cafe for the 1888 World Exhibition, later abandoned and reconditioned as history museum till 1920 when it finally held the Zoological Museum. Usually, it is known as The Three Dragons Castle. By the way, in between the Geology and Zoology museums there is also the Hivernacle, a gorgeous greenhouse. Both museums exhibit some interesting collections donated by Francesc Martorell i Peña, archeologist and naturalist plus later additions. The Zoology Museum is above all a place to remember those times in which natural science was a passion in Catalonia, a historic building with a charm of its own and not a top notch interactive institution. Come to think of it, that's the good thing about these premises, rickety furniture, dusty shelves, musty smell, spiderwebs, last century trophies and fascinating animals looking at you mysteriously. Maybe I am exaggerating here but you get the idea. Esta es realmente hermosa. Nunca estuve en la zona o supe del museo en mis pasadas por Barcelona. Seguramente la proxima vez. Gracias Carlos por tus palabras. Un abrazo. Awesome structure under a wonderfully blue sky! Nice shot Carlos! Really delicate tower for a zoo!! I guess you have a magnificent view from that fancy tower! Fantastic details~! Absolutely exquisite! I could stare at this tower for a long, long time...just tracing the details with my eyes. Great detail and awesome blue !! !